People say that ignorance is bliss. What about when you are no longer ignorant? That bliss disappears in a hurry. Maybe you’ve been blissfully unaware of prospect research, but now you know. Or, you’ve known about it, but haven’t made screening prospects a priority. Either way, you’re desperate to make up for lost time and excited by the fundraising opportunities. You’ve decided to catch up quickly and you are ready to hire a prospect researcher. One problem though, you’re new to the entire field of prospect research and don’t know where to start with your recruitment. We’ve got you covered! Below is a four-point breakdown of the development position of prospect researcher. Point #1: What is a prospect researcher? Walk before you run, right? Well, you can’t exactly recruit a prospect researcher if you don’t know what one is. Just as prospect research varies by organization type, the position is going to change slightly from organization to organization. In the context of this discussion, and a larger understanding of the role, a prospect researcher is a full time member of a fundraising/development team who provides deep background on high quality prospects. More specifically, the researcher will be looking into prospects’ histories with the organization, motivations for philanthropy, and recommendations for solicitations. Let’s unpack that definition a bit. The researcher will be responsible for taking potential major donors and delving into their backgrounds with your cause and philanthropy in general. The staffer will then take what he learns and curate the ultimate solicitation approach for each researched prospect. Prospect researchers should be major gift gurus. Dedicated prospect researchers are most commonly hired by educational institutions. Organizations with full time researchers are hiring those individuals because they’re seeking a good return on investment. At a large, educational institution, one major gift acquired by a prospect researcher can pay that employee’s salary for the year and then some. Point #2: What will be a prospect researcher’s key responsibilities, duties, and activities? A prospect researcher will be part of your development team. We’ve already discussed the general outline of this point in the definition of the role in point 1. 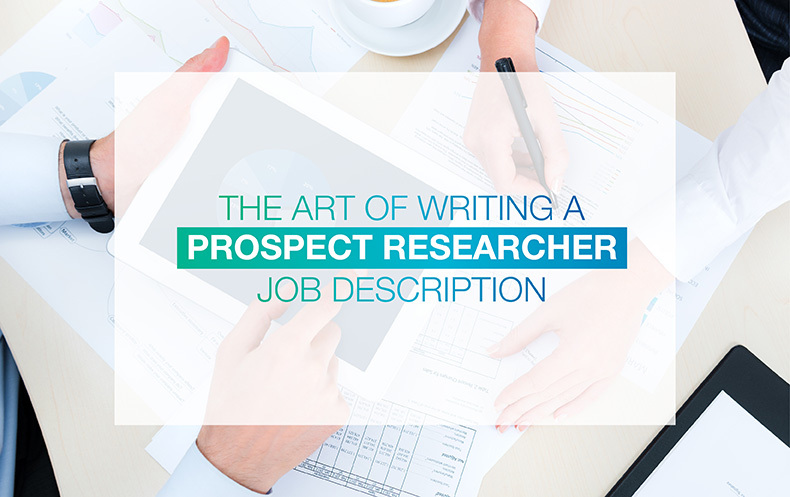 This section will serve as a multi-part breakdown of the various responsibilities, duties, and activities associated with a prospect researcher. This list consists of researcher tasks commonly included in job descriptions for the profession. The job description is going to change based on the type of organization hiring the prospect researcher and the make-up of the staff already in place. Some prospect researchers will be the only ones on staff. Others might be part of a team that has even more additional prospect research tools at its disposal. Point #3: What are the respective recommended education and experience levels for prospect researchers? We’ll begin with education. There’s no such a thing as a degree in prospect research. Organizations typically require a Bachelor’s degree. This might seem obvious, but a prospect researcher should have a demonstrated track record of doing extensive research in his academic career. Although prospect research isn’t a major in college, there are nonprofit-related majors, so those are always good to look out for. Even if a researcher majored in Philosophy, she could still be very effective if she has a working knowledge of the fundraising community, as well as a natural aptitude for it. It is also important to note that job postings will average a requirement of 1-2 years of related work experience. Point #4: What should be in a prospect researcher’s skill set? 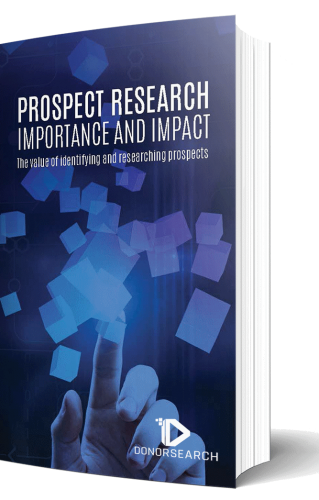 Prospect research is a high pressure profession with a lot of money on the line for your organization. You want to ensure that you’re hiring the most qualified candidates to round-out your development team. A prospect researcher has the ability to put your high quality donors under the microscope. She can take a potential donor from the start to the fundraising finish line. Prospect research can reveal all sorts of details about a constituent. Maybe one of your loyal donors is a major giver for another organization. A prospect researcher can take that information and formulate a plan to acquire a major gift from that loyal donor. Prospect researchers–and just prospect research generally speaking–are fiscally beneficial to your organization. A thorough screening can generate new prospects, uncover potential planned givers, help your team refine its outreach strategies, and much more. In order to succeed in acquiring those high quality donors, your organization needs to utilize prospect research. To use a basketball metaphor, when looking to score major donations, let your prospect researchers be your team’s point guard. Prospect researchers are there on the court with the rest of your development team, always ready for the bounce pass assist, open layup, or 3-point bank shot. Want to learn more about Prospect Research? Request our free white paper today.